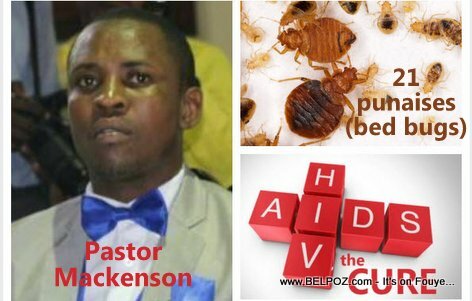 Haitian Pastor Mackenson Dorilas who recommended 21 bed bugs as treatment to his faithful followers suffering from HIV/AIDS has to present to court Tuesday, September 11 in Croix-des-Bouquets to answer questions. A live video broadcast shows the Haitian pastor prophet giving a list or ingredients to 43 young women and 25 young men suffering from HIV/AIDS to compose a cocktail that they have to drink for 21 days that will cure them from HIV/AIDS. This same pastor asked young single mothers in his church to go out there and sleep with lots of men if they have to to educate their kids including school principals. "This invitation is addressed to you to discuss around the exercise of your ministry of prophet, the legal conditions of your expertise you have made public and the regulatory functioning of your congregation with regard to the respect due to the health of citizens, in accordance with the provisions of Article 19 of the 1987 Constitution as amended on 9 May 2011"